April 2015 n Performance & Hotrod Business n 75 shops, but most seem to be projects of backyard mechanics." Military Vehicle 'Motorpools' The sizes of the "motorpools" that house military parts and restoration busi- nesses vary a lot. Kavanaugh runs a one- man operation from a 3,000-square-foot shop. Midwest Military is a one-man hobby turned business. Its website shows an olive- drab-and-white, 8,400-square-foot shop and warehouse decorated with military- style graphics. Three people work there. Bazil used to have five employees, but has had to cut back. Omix-ADA has over 300,000 square feet with warehouses in Georgia and Kansas. It currently employs over 100 full- time workers and has an in-house engi- neering department for exclusive product development. 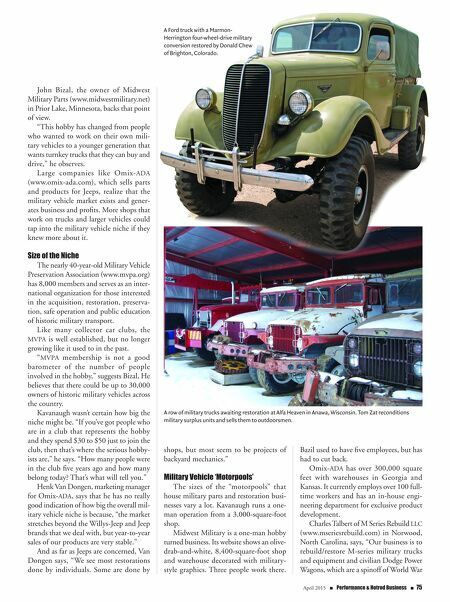 Charles Talbert of M Series Rebuild LLC (www.mseriesrebuild.com) in Norwood, North Carolina, says, "Our business is to rebuild/restore M-series military trucks and equipment and civilian Dodge Power Wagons, which are a spinoff of World War A Ford truck with a Marmon- Herrington four-wheel-drive military conversion restored by Donald Chew of Brighton, Colorado. John Bizal, the owner of Midwest Military Parts (www.midwestmilitary.net) in Prior Lake, Minnesota, backs that point of view. "This hobby has changed from people who wanted to work on their own mili- tary vehicles to a younger generation that wants turnkey trucks that they can buy and drive," he observes. Large companies like Omix-ADA (www.omix-ada.com), which sells parts and products for Jeeps, realize that the military vehicle market exists and gener- ates business and profits. More shops that work on trucks and larger vehicles could tap into the military vehicle niche if they knew more about it. Size of the Niche The nearly 40-year-old Military Vehicle Preservation Association (www.mvpa.org) has 8,000 members and serves as an inter- national organization for those interested in the acquisition, restoration, preserva- tion, safe operation and public education of historic military transport. Like many collector car clubs, the MVPA is well established, but no longer growing like it used to in the past. 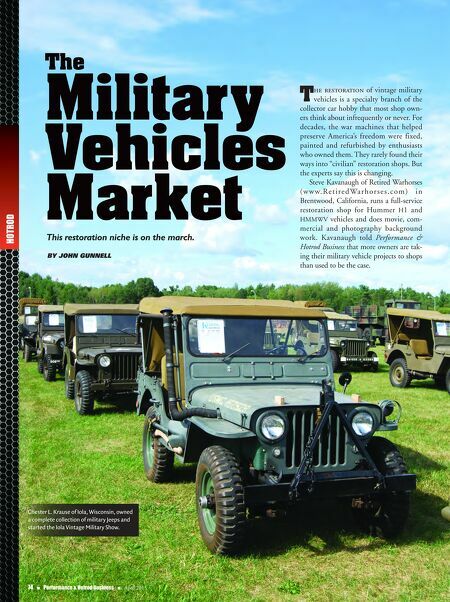 "MVPA membership is not a good barometer of the number of people involved in the hobby," suggests Bizal, He believes that there could be up to 30,000 owners of historic military vehicles across the country. Kavanaugh wasn't certain how big the niche might be. "If you've got people who are in a club that represents the hobby and they spend $30 to $50 just to join the club, then that's where the serious hobby- ists are," he says. "How many people were in the club five years ago and how many belong today? That's what will tell you." Henk Van Dongen, marketing manager for Omix-ADA, says that he has no really good indication of how big the overall mil- itary vehicle niche is because, "the market stretches beyond the Willys-Jeep and Jeep brands that we deal with, but year-to-year sales of our products are very stable." And as far as Jeeps are concerned, Van Dongen says, "We see most restorations done by individuals. Some are done by A row of military trucks awaiting restoration at Alfa Heaven in Anawa, Wisconsin. Tom Zat reconditions military surplus units and sells them to outdoorsmen.